The author, Fran Veal, gave me a copy of this novel in exchange for my review. I will openly admit to readers to rolling my eyes when the parallel world angle entered the story. The story had been wonderfully tense and brutal and then Hannah is starting this new life and a handsome boy who can show Hannah a new world sweeps into the scene. Yawn, right? I was wrong. Where Veal takes this plot device is one of the better elements of Finding My Escape. The ending of the novel, which I won’t give away, is brilliantly done for the intended age group respecting their intelligence and giving them an excellent entry novel to the thriller genre. Finding My Escape has the feeling of an author that carefully considered all elements. The main character, Hannah, witnesses a great trauma and she spends the first part of the book numb. Instead of skipping this transition, which would be the easy route, Veal eases Hannah into her new life in Tennessee. Hannah is a very authentic feeling teen but readers have the knowledge, despite the fact that she can’t remember anything, that this event has changed her profoundly as it would any child. She has lost the two most important people in her life and to come out of that takes strength of spirit which Veal shows us Hannah has in droves though she is helped by aunt and her empathy for the sorrow that character faces. Hannah faces of choice between reality and giving up and with each step into this stunning story, readers aren’t sure of what she’ll choose. Twelve-year-old Alex also read, Finding My Escape . She’s been on a something of a thriller kick of late and I thought she would enjoy this novel. Alex enjoyed the writing style of the story if not some of the boy/girl dynamic. She told me that there were so many hormones on the page at one point in the story that she had to “wipe them away in (her) mind.” because hormones makes girls stupid. At twelve she has yet to realize how true and real a statement she made. Alex said that Veal is a writer who trusts that her reader can handle what she writes and while the murder of the parents made her feel a little sick she thought it was very important in the broader scheme of the story. How would the killer know what she looks like if Hannah didn’t see her parents die? She also liked the uncertainty of the parallel world. Parents will want to consider their child’s age and comfort level with difficult subjects before buying Finding My Escape . Alex has read “Harry Potter,” “The Hunger Games” and “Divergent” so is well acquainted with this level of lightly graphic violence. 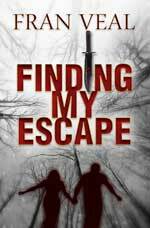 Finding My Escape is a novel for all genders and all ages so if you like thrillers with a twist, pick up this wonderfully written novel today. Fran Veal is based in Murfreesboro, Tennessee and is the author of Finding My Escape and the sequel, Finding My Way Back (Finding My Escape Series – Book 2). For more information about Fran Veal and her work, visit her website. You can connect with her on Goodreads and Twitter @franveal.